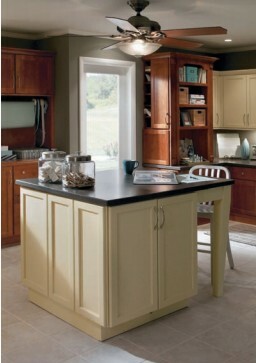 Everyone wants a kitchen that will have their friends repeating “wow,” or better yet, leave them speechless. The key to achieving this is in the details. 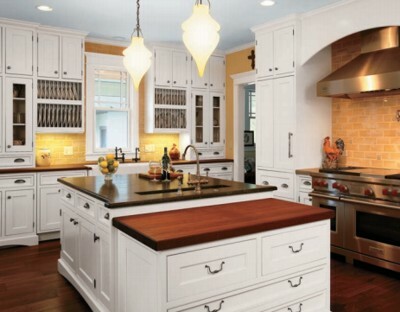 From the crown mouldings, to the selection of cabinet hardware, to the backsplash, there are many ways to add personality and charm to a kitchen. 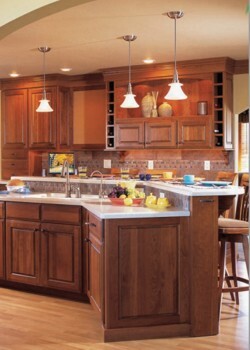 For example, consider how many details are involved in choosing the right cabinets. There are the many choices of wood species (from alder to white oak to hundreds of exotic veneers), finishes (stains, paints, glazes, sheens), mouldings (dentil, light rail, cove, etc. ), and the many various heights, depths and storage options available. Trained kitchen designers know all the possibilities that are available, which choices are meaningful and how to put them all together to achieve a unique style. Oftentimes, the blueprints for a kitchen only provide a footprint of the layout, without any details, because the architect may not necessarily know all of the options that may be available or desired by the homeowner. This is where kitchen designers come in. Since they know all of the available options, they can work to flesh out all of the little details. 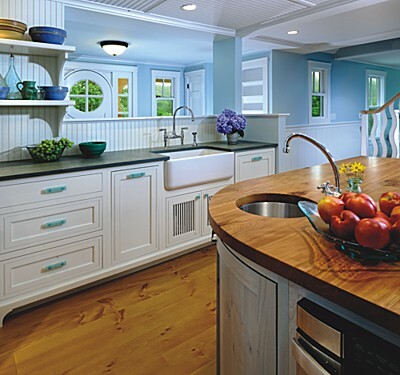 Our designer’s solution was to use white Crystal GreenCore cabinets with aqua-colored decorative hardware. The hardware helped accent the oceanic theme of the space, with the walls just outside of the kitchen being painted a light blue. 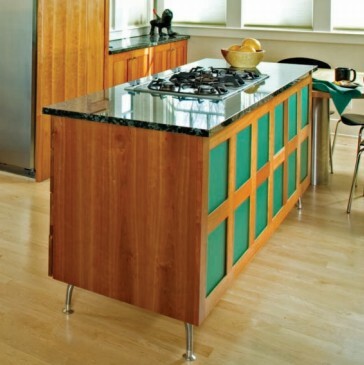 For the countertops, Vermont slate was used on the perimeter, and reclaimed beech wood was used for the island top. These gave a very natural feel to the space. The end result was a kitchen with an old country kitchen feel, but with outdoorsy elements that are both charming and environmentally-friendly. When you discuss cabinet or countertop options with any of our designers, we hope that it inspires confidence, like a visit with an old friend, in your decision making process. That has always been a large part of our success. When a designer gets to know you and your individual style and viewpoint, he or she can always do a better job in making a kitchen space that you will enjoy for a lifetime.